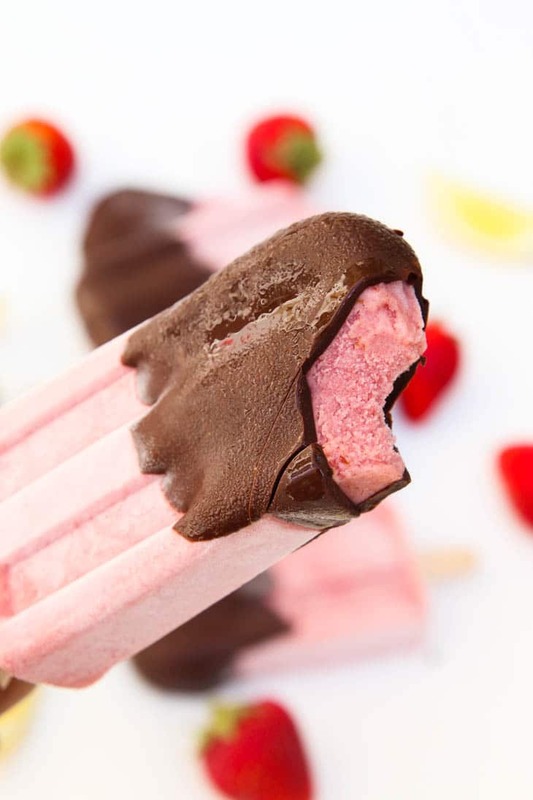 Strawberry and date sweetened, creamy, rich, Chocolate Covered Strawberry Popsicles! They’re vegan, gluten-free, and so easy to make. The perfect cool and refreshing treat for a hot summers day! No summer is complete on my site without creating a new popsicle flavor for all of you! 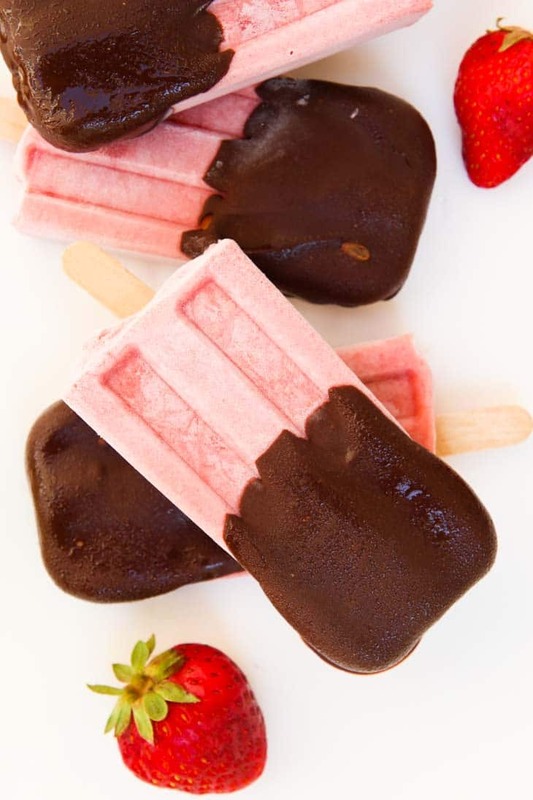 These Chocolate Covered Strawberry Popsicles are to-die-for!! I LOVE chocolate covered strawberries, or strawberries with whip cream, and with berries being in season, it’s the perfect thing to turn into popsicles. 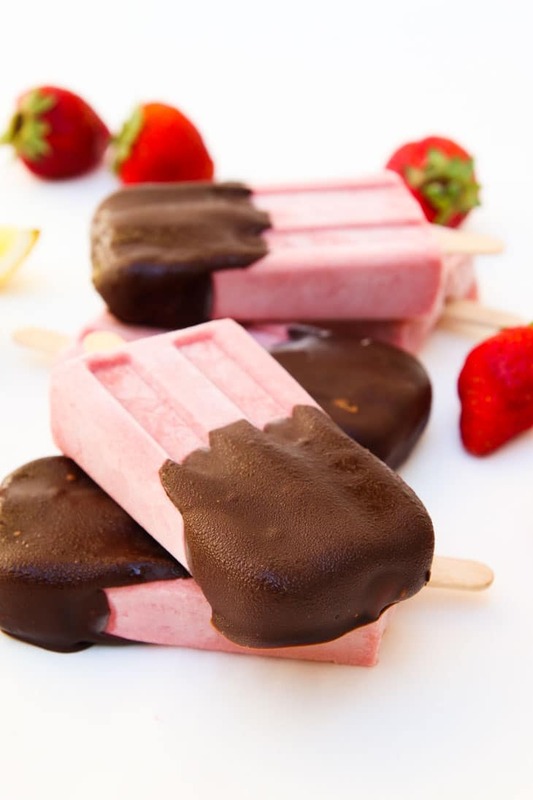 These popsicles are strawberry and date sweetened. Let’s face it, everyone loves popsicles. And if you’re reading this thinking that you’re one of the few that doesn’t…well I guarantee these will change your mind. Popsicles are one of the easiest things you can make at home instead of buying the store-bought sugar-filled versions. When it comes to healthy, clean, refine-sugar free, naturally sweetened popsicles, there are TONS of easy recipes out there! You really can’t go wrong. The easiest type you can make is to blend up some ripe fruit, pour it into some popsicle molds, and freeze it for some Fruit flavors. Or if you’re craving the creamy chocolate fudge type popsicles, and I’m talking about the really rich kind you just can’t get enough of, check out my popular Creamy Chocolate Fudge Popsicles! If you want to get a little fancier (but still keep it super easy! ), check out one of my childhood favorites, Orange Julius Popsicles. The options are honestly endless, all it typically takes is a blender or food processor and some popsicle molds. How Do You Make Strawberry Popsicles Creamy? I wanted to keep the bananas out so that the flavor stayed true to the strawberries. To soften and bring out the sweetness and juice from the strawberries, I simmered the diced strawberries with dates (instead of refined sugar) in a little water prior to adding them into the blender. Combine it with a little coconut cream, lemon juice, and vanilla and you have yourself a delicious creamy strawberry puree! I mixed in some finely diced fresh strawberries prior to pouring them into popsicle molds, but you can just as easily leave them strawberry-pieces free. And of course, who doesn’t love a little dark chocolate coating!! The chocolate is completely optional, the popsicles are still AMAZING without them (trust me, I was licking my blender clean), but the chocolate coating takes it over the top. TRY these!! Hopefully I’ve inspired you to make your own popsicles, whether it’s this recipe, one of my previous popsicle recipes, or any other you find or create on your own, it’s SUPER easy, fun, so much healthier than store bought ones, and perfect for the summer time! 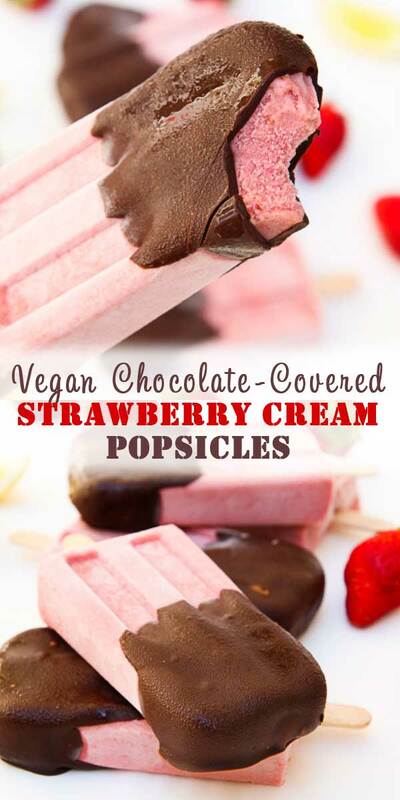 Chocolate covered strawberries turned into popsicles with this delicious healthy, refined-sugar free, creamy refreshing dessert! It's pure indulgence in the form of a cool and creamy treat! Add in the 2 cups quartered strawberries, water, and dates. 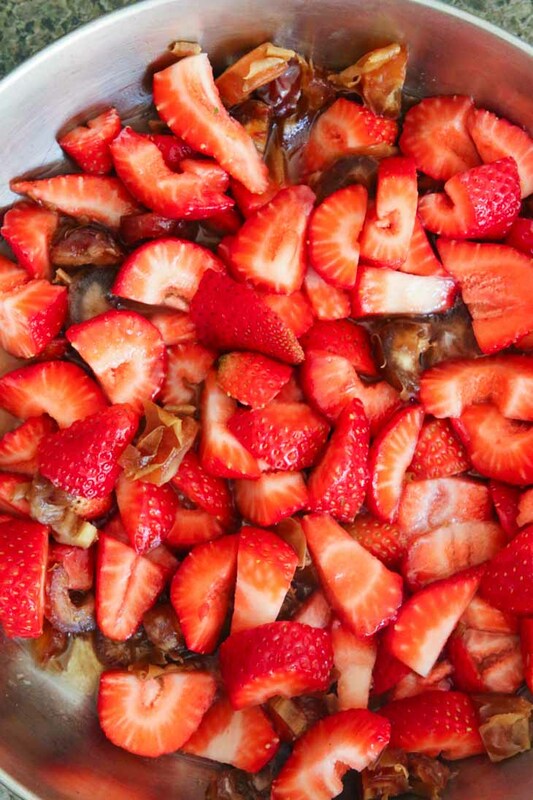 Simmer on low-medium heat until you start to see the strawberries and dates soften and juices release (~10-15min). Turn the heat off, remove pan from stove, and allow the strawberry-date-water mixture to cool. Once cooled, add the strawberry-date-water miture, coconut cream, vanilla extract, and freshly squeezed lemon juice into a blender and completely puree (I used my Vitamix, but any blender should work just fine). Pour the contents of the blender out into a mixing bowl. If using, mix in the 1/2 cup of finely diced strawberries. Pour mixture into popsicle molds and place in the freezer overnight! At this point, the strawberry cream popsicles will taste delicious as is. So technically you can stop at this point, but to take them to the next level, let's DIP them in dark chocolate! Line a baking sheet with parchment paper and place it in the freezer until ready to use. This will help keep the chocolate covered popsicles cool while you are working with them. Completely melt the dark chocolate and coconut oil together using the double broiler method. The melted chocolate should be pour-able. Remove from heat and set aside. Work with 3 popsicles at a time and work quickly to keep the popsicles from melting. Remove 3 popsicles from the freezer mold. Remove the lined baking sheet from the freezer and set aside. Dip the top half of both sides of each popsicle into the melted chocolate (or use a spoon to pour). Be sure the chocolate is well coated and place immediately on the chilled lined baking sheet. After all three popsicles are done, place the baking sheet back in the freezer until you get the next 3 ready. Repeat this step to coat the remainder of the popsicles, working quickly. Once you are done coating all the popsicles with chocolate, keep the baking sheet in the freezer to allow the chocolate shells to harden and then enjoy! Store any extra popsicles in a freezable airtight container with parchment paper in between the popsicles layers. Keep in freezer and enjoy on demand! Coconut Cream - Be sure to use the thick coconut cream for this recipe. I like to buy the cans of coconut cream from Trader Joe's for this recipe, but you can also place a can of Thai Kitchen brand full-fat coconut milk in the fridge overnight and use the thick solidified separated part of the can when opened (use the leftover coconut water in smoothies). This recipe is sweetened entirely by strawberries and dates. If you feel like you need additional sweetness, feel free to add in one more date. For this recipe, I recommend using your favorite vegan dark chocolate bar or Enjoy Life brand Dark Chocolate Chips (vegan). Aaaahhh Anjali...I should sue you for doing that to me....Just mouth-watering photographs :-( I need in my life ASAP and in my belly faster :-D This is by far the BEST popsicle recipe I have seen to date! 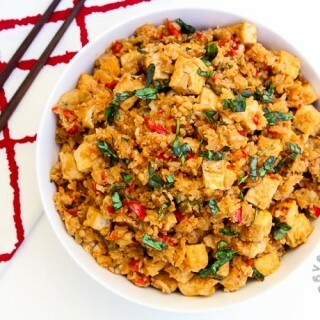 It looks absolutely delicious and you have definitely inspired me to make my own. I cant wait to try it. Haha you are hilarious! Glad the photographs are making you drool =) These are super easy to make, hopefully you have all the ingredients so you can whip them up because its super easy!! These are one of my favs, along with my chocolate fudge popsicles! If you try them out let me know!! Would love to see! Can't wait to try this! Just ran out of strawberries, so I'll need to make it to the store first :). Can't wait to get your opinion, you'll love them! Aww thanks Reshana! Hopefully you guys get a chance to try them out! You'll love them! YES! That's exactly it...thanks Rebecca! These are incredibly tempting but at least they are guilt free! Summer is the perfect time for popsicles and I look forward to trying these. 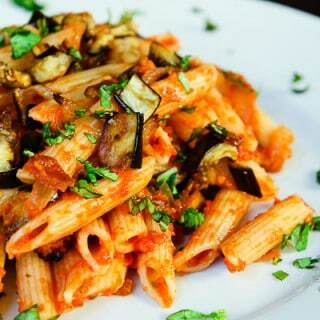 Yes...guilt free, rich, creamy and delicious! You can't really ask for more ha! Let me know if you try them! Thank you!! Yes, my kids LOVE these! They're a huge hit! These are so incredibly luxe -- I cant wait to try one! Aww thank you!! Let me know if you do! Perfect summer recipe. These popsicles looks so beautiful and delicious. Lovely clicks! 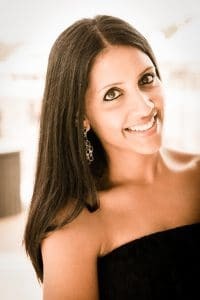 Thanks Kushi! They really are...let me know if you try them! These look so delicious! I love strawberries and dark chocolate. I keep saying I need to buy some popsicle molds, and you've inspired me to make it happen! Thanks Andrea! YES you so need popsicle molds! It's the easiest summer treat. Especially when you have these on hand! I always wondered how people dipped popsicles without them turning into a goopy mess! This was so interesting- and delicious! Thanks Sarah! 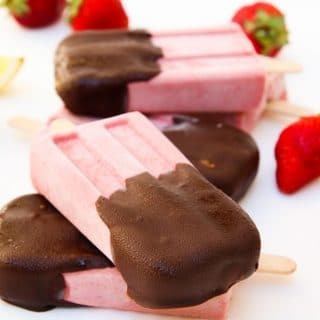 Yeah, you definitely need to work fast and dip them before they start to melt otherwise some of the creamy strawberry popsicle will get into the melted chocolate which will then create a huge mess. Towards the end of making all of them, I think my last one had a little mixed in, but otherwise it worked well, as long as you work fast and work in small numbers! Thanks Natalie! And yes...haha having popsicle molds makes these much more feasible =) Although you could just as easily drink the filling straight out of the blender with a drizzle of chocolate sauce and it'll still make for an awesome drink ha! But frozen desserts and popsicles are so much more fun, especially when you get to dip them in chocolate! Instead of strawberry and refined sugar, I thought simmering strawberries, water, and dates would work really well and it so did! I love bananas, but didn't want to use them here otherwise I knew I'd end up with banana tasting popsicles ha! Between these and my chocolate fudge ones i'm SET! On and your mug funfetti cake! Thanks Mandy!! Yeah as much as I love bananas, sometimes the flavor just overwhelms everything. Simmering the strawberries and dates was a last minute decision but ended up working out so well! These look delicious! I love that they're date sweetened. I just picked up some new popsicle molds on Amazon last night and I'll try them out with these! Thanks Gin! Yes...these are the perfect popsicles to start with! Or my fudge popsicles...both are awesome! Chocolate and strawberries goes together very well. Kids like it very much.